In human subject research ethics, we appeal to principles of respect for persons, beneficence, and justice. In laboratory animal studies, the three Rs (reduce, refine, replace) are key touchstones, along with an overarching principle of promoting animal welfare—when consistent with the needs of science and within the constraints introduced by the institutional setting. 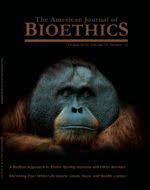 Underlying these different approaches to research oversight are moral status assumptions regarding human and nonhuman animals. Independently of whether appeals to moral status are a specious mechanism to differentiate the two research contexts, there are important structural differences in how the research is typically conducted: in an animal “confinement” facility where conditions are controlled and consent need not be sought, versus with human participants in society whose consent and active compliance is critical.